The Galapogos Islands are truly unique in the world. All islands of this archipelago are wonderful and mysterious. Galapagos is known for its numerous endemic species and the studies of Charles Darwin that led him to establish his theory of evolution. This extraordinary natural laboratory was declared a World Heritage Site by UNESCO. They are located in the Pacific Ocean. They are about a six hundred miles to the west of Ecuador, a country that is located to the northwest of South America. Centuries ago the islands were used as a refugee for filibusters and pirates, today is the paradise of tourists and scientists .The name of these islands is owed to one of the species that inhabit the place: the giant Galapagos turtle. Visit the living museum of evolutionary changes in the world and learn about the variety of native species of this exotic archipelago. The Galapagos are the perfect place to understand the evolution changes that have given a new perspective of life on the planet. Among the various animals that exist in Galapagos, we find: the giant tortoises, a variety of birds such as blue-footed, red-footed, flamingos, frigatas, albatrosses and little penguins, galapagos finches among others. We find around 14 different species of boobies which served Charles Darwin as an evidence for his theory of evolution by natural selection. Also there is an incredible variety of marine life such as sea lions, dolphins, whales and thousands of multicolored fish. The Galapagos have a high percentage of endemic species. The biggest problem affecting the biodiversity of the islands are the introduced species of plants and animals, they are a major threat to the species endemic to the Galapagos. Therefore strict control is required at the entrance of the park. The Galapagos Archipelago or Colon is considered a Natural World Heritage Site. It is a sanctuary of ancient species that were stopped in time and space, and that the mid-19th century to be visited by Charles Darwin, inspired his Theory of Evolution of Species. This area presents extraordinary biological characteristics, mainly due to ocean currents from tropical and subtropical regions converge on the islands, bringing animals from the Pacific and part of the Indo-Pacific, creating a rich biodiversity and producing both a privacy curtain genetic. The temperatures of these streams also contribute to the variety of marine ecosystems. Therefore there is a 23% endemism and is also the only refuge for endangered species of reptiles and marine mammals, like turtles and whales which find in the Archipelago its main breeding. The Enchanted Islands are also the birthplace of the Theory of the Origin of Species Charles Darwin, who visited them in 1835. Today the islands contain one of the world's most active volcanic groups. Tourism to the Galapagos Islands has increased since 1970 and the number of tourists has been growing strongly due to high demand. This islands emerged about six million years ago and are of volcanic origin, they have elevations with large craters, some still are in activity. Its geographical location becomes interesting for those who visit both islands and sea: white and radiant beaches, dark and solid basaltic rocks. Here you can enjoy rare landscapes, clear waters, trails suitable for recreational or research and underwater sports walks. 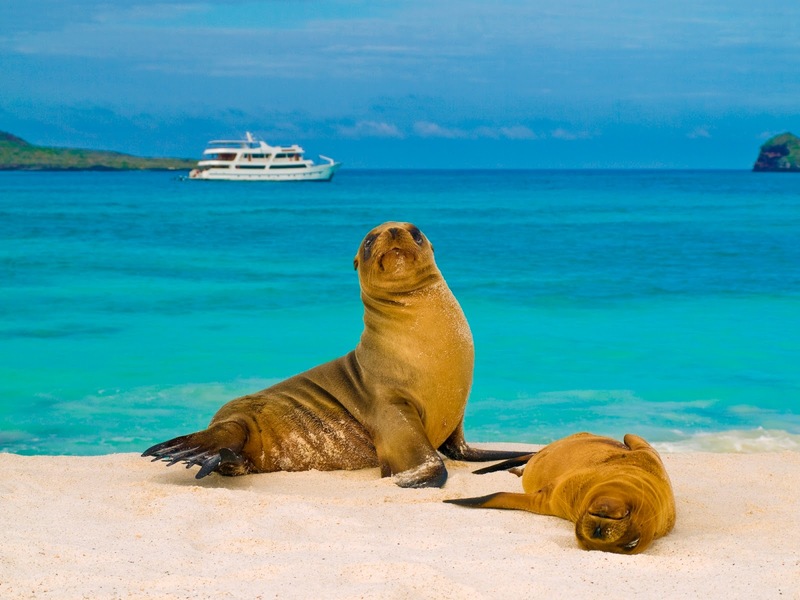 The Galapagos are world famous as an ideal place for snorkeling and diving. The Galapagos National Park belongs to the province of the same name, has 13 islands and more than 40 islets or rocks in which countless animal and plant species lives. In Galapagos you can do kayaking, surfing, diving into the depths, cycling and snorkel. And all these exciting activities are developed in a safe environment and surrounded by unique landscapes. 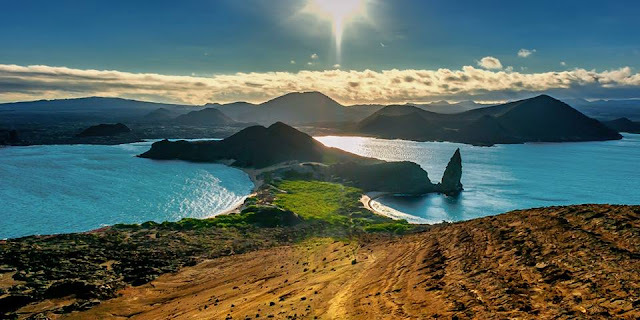 In the Galapagos Islands have two airports: The first is in San Cristobal Island and the other on the island of Baltra arrives where most tourists to visit and explore the enchanted islands. Most visitors come by cruise scheduled 4, 5 or 8 days in economic yachts, tourists or tourist superior, with the comfort they deserve visitors. The best way to enjoy and discover the Enchanted Islands is staying in cruises and travel by boat to each island so you can meet even the most remote. A naturalist guide always travels on cruise ships. The warm and wet season lasts from January to June. The cold, hard dry from July to December and brings colder water temperatures season, so remember to bring your wetsuit. The Galapagos archipelago is located on both sides of the equator, about 970 km (600 miles) west of continental Ecuador. Because of the thousands of tourists that the islands received every day we have a great variety of luxurious hotels that offers many tours around the islands. There are from really basic and cheap tours to more complete and expensive tours. If you don´t want to go to a hotel you have another choice that are the cruise, that offers the possibility of traveling more and visit many islands as you want.